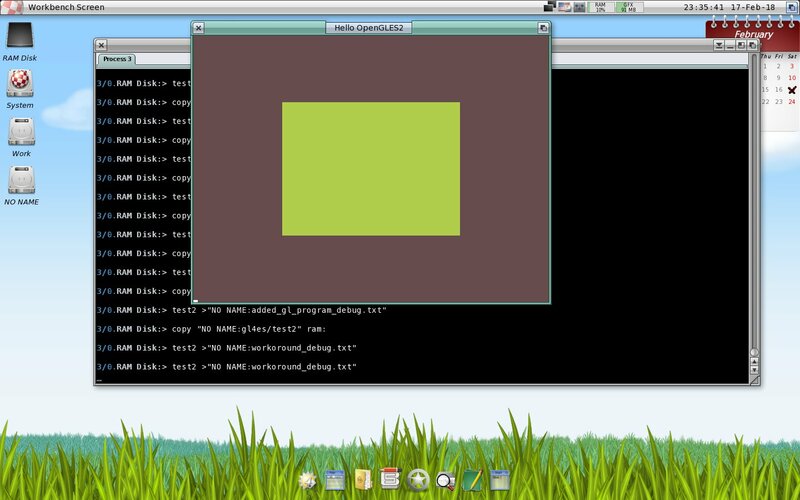 As some of you may know, there was another attempt we discuss before which make OpenGL apps to works on OpenGLES, which called called glshim. Seeing from comments on github, you may see that since 2016 development mostly stop, and in 2017 there was only one commit. Butits all about glshim originally. Then, at some point (in 2015 or something), another author made a fork of it, and start to develop it futher (at begining in parallel with glshim, then probably author of glshim loose interest and only that fork is continue to develop). Its quite active even today. And to have 2 wrappers (Regal and GL4ES) is better than have only Regal, and i give it a go as well. Structure of project not that good as Regal's one, and it's depends not only on X11 in few parts , but also on EGL. It also use CMAKE , and not pure makefiles , that is kind of boring always for normal tests to be honest. 2. For eglGetProcAddress to get extension function adresses. 3. for eglSwapBuffers to swap buffers (actually put drawing onscreen). It should be working for you now. Compile with NOEGL (the NOX11 will be set anyway). Use with Export LIBGL_ES=2 (or define a DEFAULT_ES=2 at compile time). You need to SwapBuffers yourself. To stay on the safe side (because gl4es has many optimisations and may cache/batch drawing calls), it's better to call either glFlush() or glFinish() before the SwapBuffers. So, all of this even better for checks: As i of course need and want to create GLES context myself, as well as i for myself want to do aglSwapBuffers(). Through, at moment not everything handled as need it with NOEGL, as well as there is other code-compile bugs (strange! ), but he seems still to works on , and we can expect something soon ! Some info: we are able to build all objects of main gl4es code, make a link library from it, and even try to link it against test code : have some bunch of undefs which need to be fixed, but proably soon. 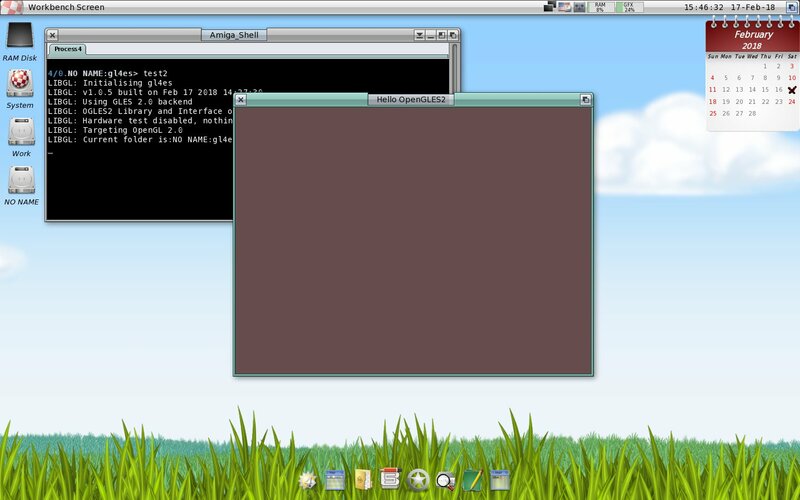 Also, he add amigaos4 target as well, so it's all will be in repo. Do i understand right, that our os4's dlopen/dlsym() will works only for sobjes, and not for real amiga libs ? I can't be of any help with all this stuff but you have all my support, hoping that you'll be able to do something with the final result. Which of course, will not work probably as imho dlopen/dlsym its all about shared obejects only. Will try your solution now, thanks ! Can you also point out plz how later it used. I.e. you open somewhere ogles2.library, and when you call AmiGetGLESProc ? Maybe you can have a look at that loader.c file, and have idea how we can integrate it all there. dlopen open an handle, and "load" a dynamic library. Then, with dlsym, you get address of a function based on it's name. This fonction will do some specific stuff, depending on the parameters used (for example, you can call with GL_QUADS that is not supported on OGLES2, but is supported on full OpenGL, and gl4es will handle that as well). At some point, gl4es will call the "real" glDrawElements(...) from OGLES2 driver, so it will get the function pointer using dlsym(gles, "glDrawElements") and call that function, so the GLES2 driver can draw the things. Mind you, it's blindly coded, tested by the few brave.. I must insist, gl4es is not working like Regal. Regal create some new function, with a different name, where gl4es create full OpenGL functions. I have not created any "mangling" mecanism for gl4es. gl4es is an OpenGL library: you put it in your system and you use OpenGL program without recompiling. Now, can I just use that AmigaGetGLESProc(...) function from SDL? will it give the ogles2 function pointer without masking the gl4es function? Use the interface to the ogles2.library directly rather than any stub library, that you might use for compiling simplicity. eg MiniGL programs are usually linkied against libminigl.a or .so which contains stub functions that call the library calls. I'm assuming that ogles2.librray will work similarly. The library *could* be opened in a constructor, it need not be opend in the link lib ne it static or sobj. The Interface could be extern to the new library and provided in the users code. Thanks ! That was helpfull. So kind of expected, but that quite step. Probably very soon we will see something rendered ! As you can see, there in source i didn't open ogles2.library, and didn't worry about interfaces and stuff: that done inside of gl4es. Also as you can see, QUADS which should be drawns : didn't. That can make probably that gl4es shaders fail on NOVA's shaders. That to be checked. That was pain ! It was _much_ harder than Regal. Main author spend 2 full days on adding os4 support, finding bugs, fixing stuff, etc. But good news : its all in repo. Even cmake updated to have amigaos4 target. Through, at moment i use pure sh script, which is easy for fast test. Ok all initial bugs fixed, and so to the same speed tests we do with Regal, MiniGL and MiniGL-Reloaded. As you see, the result is much better than with Regal. Its on pair with MiniGL, which , do not be confused, very good result for such a simple test case because of reassons Daniel wrote in Regal's topic (slow first frame, too simple code, so not show potential of overload and so on). Can you plz run that test on your Sam, so we will see how it in compare with MiniGL reloaded. Probably on the same level, or even better a little ? ogles2.library and interface opened in the gl4es.a itself. So, once i try to run it as it, it freeze amigaos. But not all the time on the same place. Sometime, it go till initialising gl4es, and then crash (so, even didn't touch a part of code where we do amiga stuff at all), sometime go futher and then crash right after i open window. Of course for sake of tests tried to use bigger stack size too. Then, once i start remove parts of code (different ones), it works. But not the same parts of code. Its like the more code i have (does not matter what functions, etc, just more code), then it crashes. For example, i may comment some parts in the main() : don't crash. Or may comment some parts in draw(), while keep what was commented in main : don't crash. I.e. commenting out different parts of code, to make code of binary smaller (probably, i am not sure), make it not crash. Its like some overbound/overflow/dunno what somewhere. But something general. Have anyone any idea to where look at ? I mean that kind of symptoms can cause what ? It also seems, that putting Delay() all over place, can make difference for point when crash happens. 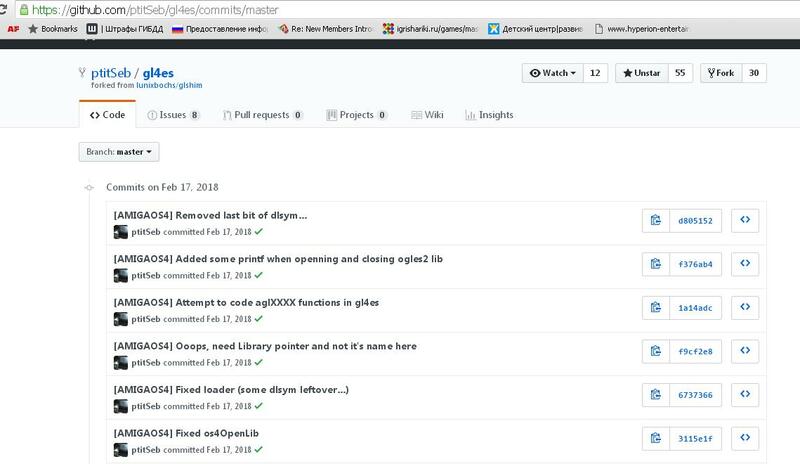 And that remind me some racecondition issues .. Maybe still that we open library and interface in the libgl4es.a itself, and in programm use just as it OGLES2, make problems ? But that can be not the case of course .. So with this test it's a bit faster than my current MGLReloaded and, no surprise, slower as original MGL. So, once i try to run it as it, it freeze amigaos. But not all the time on the same place. From a quick look, you only defined 6 normals for 8 vertices. And the size of binary lots smaller than regal one. Through in terms of compatibility regal should be better, but that to be checked. Gl4ES mostly for opengl1.5 and 2.0 for moment , but author optimize and fine tune it very well (at least better than Regal). He even say that arrays in shaders always not so fast, and he get rid where it possible of them in the generated shaders. As for crash: sure, gl-code-wise it can be wrong, but it works copy of minigl example, and even if call some stuff which make no sense to call, it shouldn't crash so heavy in different places (most of time right after open of window). The normal array has to be larger and filled with correct normals, otherwise you are at least doing illegal memory reads with potentially trashed data. And you know what trashed data for a normal likely is? Most likely not a normal anymore And a normal which is not a normal may easily provoke crashs on code which asumes that it is a normal. Please fix the normal-array and try again. It still strangely crashes: if i put bunch of printfs in Drawbox() before and after every gl call, then, its make 3 loops, and then crashes. But will firstly try to fix normales. Probably it didn't crash in Regal before, because for that example Regal create shaders with arrays (and so nothing draws, but didn't crash), while, GL4ES create shaders without arrays -> code tryin to executes -> crash. Btw, just to be sure its not in spam box : did you recieve reports on mail about glGetActiveUniform(...) and glGetActiveAttrib(...) ?